When coming to Visual Studio workflows, something which surprises many SharePoint developers is that tasks assigned in the workflow can actually be actioned by any SharePoint user with basic permissions. 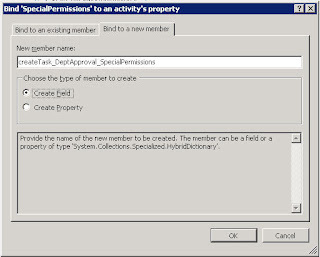 In the worst scenario, 'basic permissions' means any user with contribute permissions to the SharePoint web which contains the workflow tasks list, and clearly this could be a whole lot of users who have nothing to do with your workflows. In the best case, you might have tied down permissions so that only users involved in workflows can use the list. Even so, this still means that any actor in the workflow can respond to any task, not just tasks which have actually been assigned to them. To my mind, this is bad - all it takes is a confused user to accidentally respond to someone else's task and your workflow is in a whole world of chaos. 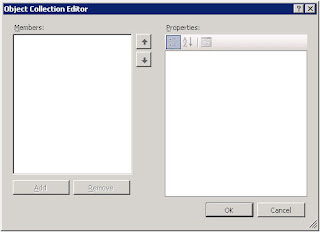 Pitfall - confusingly, clicking the ellipses button (...) for the property presents a generic VS collection editor (shown below), which as far as I can tell just flat cannot be used with this property - all the controls are disabled! So, we pass in the collection specific to each task, and also the string username for the task owner. We then add an entry for the task owner to the dictionary with the 'contributor' permission, and one for all other users with just read permissions. Note we also clear out the dictionary before adding in case this task has already been issued (i.e. something got rejected in the workflow and we came back to this task a second time) - this avoids any errors due to the key already existing in the dictionary. This would be added to the code for each CreateTask activity in your workflow. 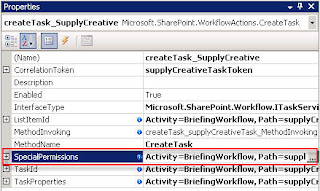 The first parameter is the variable we bound earlier to the SpecialPermissions property (of the particular task we are dealing with), and taskProps is the SPWorkflowTaskProperties object which holds data for the task. And that's it - much less code than you'd need to modify permissions for the list item with general API usage. The effect of this is that the task owner is the only standard user (administrators with full control excepted) who can respond to the task, but all others can read it. Needless to say, you could customize the code to your specific permission requirements if they are different to mine. Personally I think an improvement would be to show a more friendly message, but this would require substantially more effort and complexity. My view is that for a few lines of code, this approach is a great trade off between effort required and benefit of protecting the integrity of the workflow - I'm definitely not a fan of sleepless nights wondering just what would happen in the workflow if users unintentionally responded to tasks which didn't belong to them, so it works for me. As always, if you've implemented a different way of dealing with this problem or have other comments, it would be great to hear. P.S. I'll be expanding on this content - the next couple of articles will be workflow-focused. For anybody interested in workflow, I'll be speaking at the UK user group next week at Microsoft's London Victoria office on 10th Jan. There are two great sessions so I'd encourage UK SharePointers who can get to London to come down. Needless to say, I'll be posting my slides/sample code etc. for those further afield. For those considering coming down, the meeting should be fun and it looks like a high turnout - we have over 100 people registered already. My fellow speaker is SharePoint MVP and all-round good guy Andrew Woodward. Of the three types of workflow available to the SharePoint developer, only Visual Studio workflows provide complete flexibility and power. Without the right information however, the learning curve can be steep for the uninitiated. In this session we’ll start with initial decisions such as SharePoint Designer workflows vs. Visual Studio workflows, sequential vs. state-machine, and InfoPath vs ASP.Net for forms. From there we’ll cover the key steps to get a workflow up and running including retrieving data from an InfoPath form, configuring workflow activities, and deployment of the workflow. Over several demos, we’ll build a basic state-machine workflow, and show why workflow is a valuable addition to any SharePoint developer’s skillset. 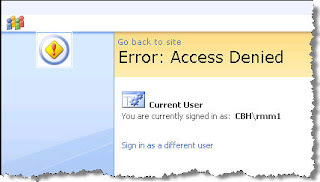 A look at the recently announced Search Server 2008. We will walk through an installation and demonstration of the new Federated Search capabilities, what’s provided out of the box, what you can get from free, how to leverage sites using Live.com and how to federate results from Google. We will discuss how this fits in with your existing WSS and MOSS deployments and the release timescales.